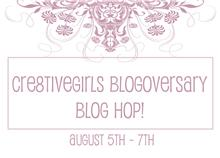 Hello and welcome to Sherrie Scraps with passion and the final day of the Cre8tivegirls Blogoversary Blog Hop We hope your having fun and finding some inspiration along the way. We have a great lineup of talented ladies to inspire you along the way!! So, lets get hoppin:) If you arrived from Georgiana's blog your in the right spot. If you happen to stumble upon my blog and would like to play along, please do so by starting at Yvette's blog over at Cre8tivegirls. My final project for the hop is Baby's "1st" Crawl. I did a 8x8 layout for a baby book that I am putting together for my daughter who is expecting a little girl this fall :) Super excited!! Hope you have been inspired by all the wonderful projects during this hop. There has been a wonderful variety of inspirations projects to get your created juices going. Hope you enjoyed the hop!!! Now for some blog candy!!!! ** I will be posting a project all three days and will "combine" all comments to choose one winner, via random.org and post the winner on Mon Aug 8th****Please note, due to shipping I can only accept USA & Canada entries. Sherrie, congrats! Will this be your first grandchild? What a cute LO! Your daughter is going to love her scrapbook! I'm sad our blog hop is done - it's been such a pleasure hopping with you! The details on your layout are great!! Very adorable! Congrats on expecting a bundle of joy from your daughter. I am working on a baby book for my daughter as well (She was just born this march). Thanks for the inspiration. this is very cute sherrie . though i m not eligible for the prize as m from india .. but stil i love you work ..
Awww Sherrie this is adorable! What a perfect LO for a baby's first. Your daughter is going to love this. It is so nice to have these LO done in advanced, this way all that needs to be done is the photo slapped in it. :) Great job. very cute lo. tfs. of course i'm a follower. Love the layout. I, too, am working on a 8x8 album for my nephew and his wife so I just might have to CASE this layout. thanks for sharing your ideas. Cute cute LO! Love the details! Thanks for the chance to win great giveaway! !I'm a follower...love your blog! Fantastic project and happpy to be hopping with you this weekend! Wow love the crawling baby So cute!!! So sweet! The flower on the baby's head is adorable! Such a cute little baby. Love the sentiment. Everyone always forgets the first crawl. So sweet. I am already a follower and subscriber. Oh, what an adorable card and I love the image of the baby -- too cute! this is such a cute Baby LO. Your daughter will love it! Dont cha just love the gypsy! What a sweet layout! I love the colors and honoring a babys 1st crawl is kool. Thx for nice giveaway, also. Adorable LO!! I love the colors and the cuts you chose. Just perfect. WOW your daughter is so lucky. I love this page that celebrates crawling. Aw! Love this baby layout! Very Sweet! What an adorable layout! Your daughter will love it! OMG!! Sherri, the layout is so adorable and love the flower on her head too cute!!! Wow, this is such a cute layout! What an adorable LO!! Congrats on your new (soon to be!) grandbaby!! I'm a follower! Super cute card. I've been having a blast with Baby Steps, but you've given me yet another idea. Thanks for sharing. I am so impressed that you're doing your daughter's scrapbook in advance! My sister-in-law presented me with the most amazing scrap book ever at the baby shower for my little girl. It brought me to tears and I was absolutely speechless...to think of all the time and love that went into making it! This is so cute. I love the flower on the baby head. This is sooo cute! You did an awesome job! What a super cute layout for you're daughter. I love it. It was great to be in the hop with you, you're projects where awesome. This is adorable :) I bet your daughter will love it. TFS! I love this LO, it has to be one of my favs! THank you so much for sharing and I'm so happy to be a new follower! Very special page for a very special baby - turned out soooo cute! super cute love it thanks for sharing and the chance to win im a follower. So precious. Your colors are wonderful and the design is perfect. Fantastic layout! I love it!!! OMg... what a cute page!! Can't wait to see the finshed album. Thankd for sharing!! This LO is adorable, TFS you did a great job!. Thank you for the opportunity to win! By the way your penguin card is really cute too. Congrats on being a grandma soon!! I love the fact that you're making a baby book for your daughter instead of buying one of those generic ones. I can't wait to be a grandma!!! and then the small white edging makes all the difference. PS...thanks for the sweet comment!